The Cathedral Church of Christ, Blessed Mary the Virgin and St Cuthbert of Durham was begun in 1043 and substantially finished within 40 years, the towers and some of the chapels being later additions. It is simply magnificent, and is considered by many to be the finest example of Norman (Romanesque) architecture anywhere in the world. Approached by steep cobbled streets, and viewed across the green, the building is absolutely stunning! The nave is dominated by massive carved pillars. The stained glass is mainly Victorian, the originals having been destroyed after the Reformation. The high altar is the focal point of the cathedral, and behind the altar can be found the shrine of St Cuthbert, its modest stone form a mere shadow of the original green marble and gold-encrusted monument vandalised in 1538 upon direct orders from Henry VIII. In the west end of the cathedral is the Galilee Chapel, where rest the earthly remains of the Venerable Bede. The cathedral's cloisters are featured in the Harry Potter films, with local schoolchildren filling in as extras. The eucharist is celebrated and the divine office prayed at numerous times throughout the week. Tourism is an important part of the cathedral's daily life, with 600,000 visitors a year. No admission fee is charged, but a donation is requested. They do, however, charge a fee for permission to take photographs. Despite the necessary trappings of big business that go along with the administration of such a place, I must say that the atmosphere as one enters is decidedly warm and Christian. Founded in 995, Durham was an important ecclesiastical and political stronghold throughout the Middle Ages. The 19th century saw the city emerge as a strategic coal mining centre. 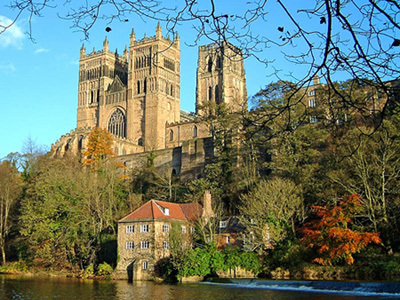 Home to Durham University, it is a picturesque old-fashioned city with cobbled streets, bustling with shops and restaurants, riverside walks and, or course, the beautiful cathedral set on a steep hill at a bend in the River Wear. There is much tourism, new and user-friendly shopping centres, light industry (and probably some heavy industry too), along with the inevitable traffic and parking problems. I'm certain there was a notice somewhere which would have enlightened me, but there was a plethora of information at the west end and I was unable to find these details. About 50 people in St Cuthbert's Chapel behind the high altar, where the service took place. Probably 200 or 300 more milling around the cathedral. There was a welcomer at the northwest door who handed all tourists a card describing the cathedral and its objectives. At first, because I was almost late, I had to stand, but then a kind young lady gave me her seat for which I was very grateful. Any physical discomfort was compensated for by the surroundings. I ascertained that a service was beginning at 12.30 in the chapel and scurried (it was 12.25) along there, beneath breathtaking Norman architecture. I passed the robed procession on its way to the chapel. The atmosphere in the chapel was reverent, but there was much external noise from sightseers. Not all unpleasant, but something to be expected and appreciated in England's most popular cathedral. "Holy Communion Rite A, Common Worship." I didn't have a book as a result of my tardy arrival, but I knew the service so this was no handicap. I was much intrigued by the demographic content of the congregation: young, not-so-young, multi-racial, male, female, some looking conventional, some in very strange attire. Stiff upper lip, Anglicanism at its purest. Apart from passing the peace, there was no interrelating. We were communicated remaining in our places, the elements administered by some of the altar party, all very devout and competent. Two moments: Being present at a celebration of holy communion at St Cuthbert's shrine. Later after we had visited the gift shop and had taken some lunch, my companion and I returned to the nave, where the choir was practising for a big service the following day. It was heavenly – voices soaring upwards, lofty Norman architecture, a beautiful and uplifting experience. There were nine or ten people in the altar party, some quite tall, and on arrival in procession they surrounded St Cuthbert's tomb, which was at ground level in the centre of the chapel. They effectively blocked off all sight (and in my case sound) of the altar and celebrant, because the congregation were seated/standing round the back and side walls of the chapel. I felt like a medieval peasant, kept in my place by my betters and well aware that my place was clearly below the salt. I had to remind myself of Who had invited me there. It wasn't really possible to do this, as there was such a melee – tourists filtering into the chapel while we filtered out. Also some rather steep steps to negotiate which required concentration. I know there were places other than that particular chapel where one could pray and be quiet, which was actually what I wanted to do. No coffee, but my companion and I went to the refectory where a varied lunch menu was available. Some of the good things were fairly-traded. 10 – I would love to worship regularly in such surroundings, and to be able to make some positive contribution to the visitor experience. Sadly, the impenetrable "wall" created in the sanctuary by the robed ministers. St Cuthbert himself was a solitary so perhaps he liked it!